High performance meets practicality. Tough terrain and steep hills are no problem for the XZ3 122. 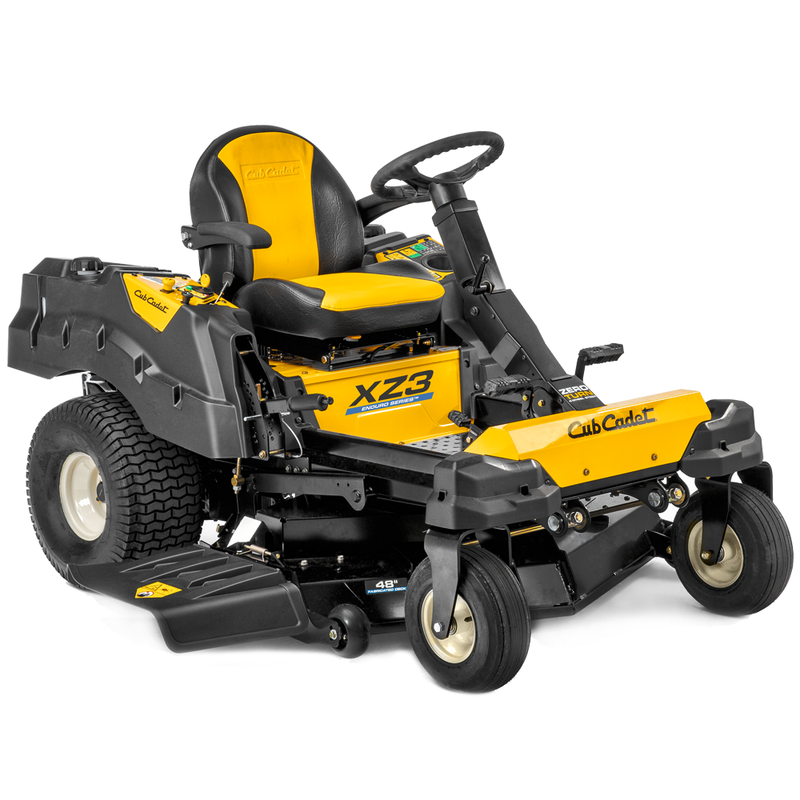 The Cub Cadet XZ3 122 has a heavy duty fabricated 48"/122cm deck with the versatility to mow around fences and trees. A low centre of gravity and wide wheelbase allow the machine to glide over uneven ground and still cut in a completely straight line across hills and slopes. The advanced mulching technology incorporated in the machine re-circulates the airflow around the cutting deck delivering effective and efficient mulching capabilities. A superior mulcher. The floating deck follows ground contours for superior cutting and a smoother and more uniform look. Every centimetre of the XZ3's heavy gauge, welded steel cutting deck has been engineered to make sure you get unsurpassed airflow, blade overlap and quality of cut. Every time. Our unique Zero-Turn riders with a traditional steering wheel provide you with the mazing manoeuvrability of a conventional Zero-Turn but with full control of the front wheels. Steering and drive are perfectly synchronised to ensure the exact speed and rotating direction of each rear wheel, whatever the position of the front wheels. The XZ3 is equipped with an adjustable steering column ensuring you can find the perfect position to suit your height so you have a comfortable seating position whilst you're mowing. Controllable pneumatic front caster wheels which support the zero-turn of your XZ3. A soft grip steering wheel for enhanced control of your zero-turn, however tough the conditions. An adjustable high-back seat with armrests makes hard work far more comfortable. Help to prevent damage to your turf when cornering tight bends. Large side-ejection deflector helps spread the cuttings over a larger area.